If there was a single trouser on the Bottega Veneta runway this morning in Milan, we certainly didn't see it, as creative director Tomas Maier was fully entranced by the feminine power of the dress and the practical pairing of skirt with sweater. Maier is a well-seasoned expert at womanly dressing, so the challenge for Winter was how to make all of this look new. He accomplished this with pleating and slits, which he cleverly cut into the constructions of the skirts and dresses. When the girls walked, their legs pushed the material to reveal a burst of contrasting coloured panels beneath. Compounding the graphic effect were fractured rays that Maier either printed or stitched into intarsias over the dress bodies. The workmanship built, as it typically does in a Bottega show, slowly and subtly, as more substantial wools, satins, leather inserts, and beading were introduced. The apex of this was densely pleated dresses, whose pattern created 3D squiggling coils around the body. But our highlight was a long sleeve wool jersey dress that was crafted from zig-zagged vertical panels of cream, black and lime. 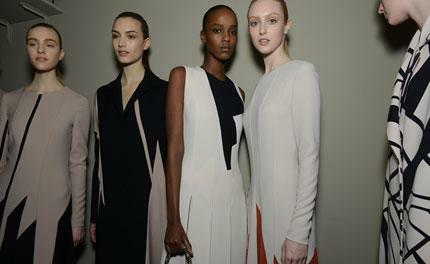 It was sharp and streamlined, yet utterly feminine.